It seems that we are gradually removing the ability of long standing users to actively maintain the culture and communication of Stack Overflow in favour of new users who do not respect the culture of high quality questions and answers. It's starting to get to me. I didn't like the removal of the close reason "no research effort" - when a user shows no effort, that is a perfectly valid reason. I didn't like the ability to state "What have you tried?" which in a case like below is again valid, because they have shown zero effort in their question. And I downright hated the removal of the "-1" prefix to comments (as did many others). So the question remains, why is the Stack Overflow staff so hellbent on punishing long standing users who effectively act as free staff who moderate the site, when new low effort questions keep flooding in? Search is getting good enough and space is getting cheap enough that good moderation isn't as necessary as it once was. 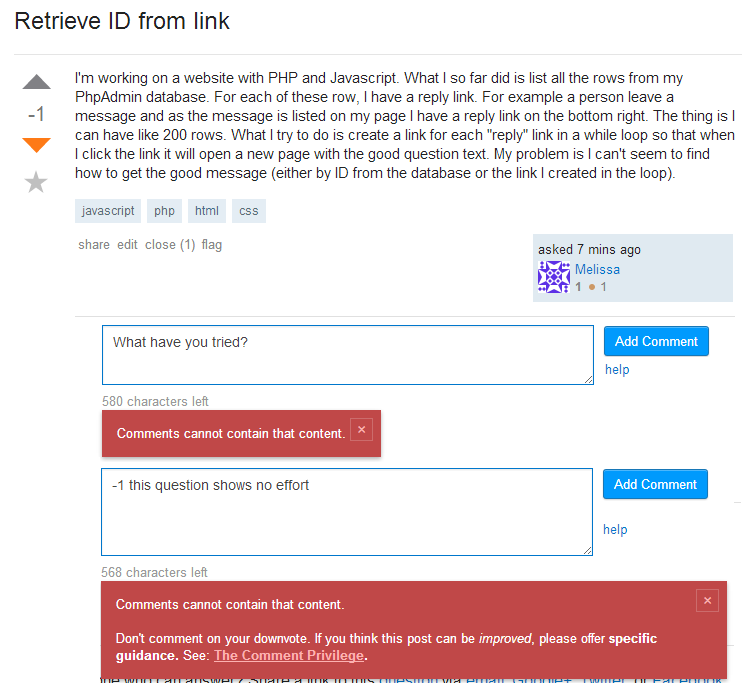 What is my incentive to help Stack Overflow, when they seem to remove everything I liked about it? Except now low quality questions from people who show no enthusiasm are welcomed. I'm not even concerned about professionalism, I'd just like a little enthusiasm. When you put in zero code into your question, that's not enthusiastic. And its not run by us, as changes (like the dreaded and much protested removal of +1 comments) are unilaterally put in place. So in summary, why does Stack Overflow keep forcing kid gloves on long-standing users at the protection of new users who show zero interest in the site? Specifically, why do we support help vampires by allowing them to come along, ask their question, get an answer from some repfarmer, and then shuffle along their way. Why can't we retain the harsh gatekeepers of old that actually encouraged high quality work? edit: True to form, in the time it took to write this rant the question I captured has been answered: How retrieve ID from link? This whole question is just... laughable. You're adding useless noise to the site by duplicating that comment. Don't do that. Such comments should be flagged as the noise they are, and deleted. Stop adding to the problem. Nobody is "punishing" you because you weren't allowed to leave a bad comment, that's asinine. How could you possibly spin that to be a "punishment" against you? So the question remains, why is the StackOverflow staff so hellbent on punishing long standing users who effectively act as free staff who moderate the site, when new low effort questions keep flooding in? That is a laughable interpretation of what is going on here. Don't post bad comments, that's it. Nobody downvoted you, you didn't lose any rep, you were prevented from taking an action that would have negatively impacted the signal:noise ratio of the site. Seriously, because you couldn't down-vote and leave a -1 i downvoted this comment? We punish lazy questions with downvotes and closure (and even deletion). You know, things that actually lead towards a question-ban. In fact, we do it so well that those users complain about it here on Meta (ironically enough). We hardly punish harsh comments at all. Be egregious enough and you can get put in the penalty box, thats about it. Otherwise the worst thing that can happen is you can't post the comment or it gets deleted. Thats not "punishment" in any sense of the word. Also remember that, due to community feedback, you can leave "-1" or "+1" in your comment, you just have to include a detailed explanation (not just "What have you tried" which doesn't really help anyone). And beyond the signal:noise ratio, which this is trying to improve, we also do need to realize that there are actual people on the other end. While I am in no way suggesting compromising the quality of the site, treating other users with respect while cleaning up their garbage is still very important. Some of the restrictions (like the one on LMGTFY) are due in large part to that (plus those comments just not being constructive at all). You can 'punish' a bad question. The best way to do so is by downvoting it. The OP has a concrete negative reinforcement for their behavior. People can ignore comments (or flag ones they don't like -- I see that all the time), but they can't ignore downvotes. Doesn't tell the OP how to fix the issue. "Show effort"? Some of the best questions don't show any effort. If you're leaving a comment for the OP, make it actionable. How could they show more effort? What could they do to get a +1 from you? Telling them you downvoted and they should show effort makes the comment about the downvote, and not about the reason you downvoted. Better to just downvote, and if you're going to leave a comment, make it actionable. Similarly, "What have you tried"? doesn't help anyone. At best they'll respond to you in the comments (instead of the question), and sometimes, they shouldn't try anything (see the answer I linked to). "From what you've written, I don't have x, y, and z, that I need to be able to solve your issue; if you edit your question with (a, b, and c) it'll help us answer you." If you're going to leave a comment; make it actionable. Those comments aren't allowed because they're not actionable. now low quality questions from people who show no enthusiam are welcomed. We welcome them with a full embrace of throttling, banning, and downvotes. Can you imagine if this happened to "harsh"1 comments? If we truly punished them the poster would receive a comment throttle, negative reputation, and perhaps even a comment ban. But we don't, we just slap you with a small red styled element that essentially asks you to rephrase. What a harsh punishment that is. Also, your "true to form" "rep farmers" (ridiculous term) have a combined total reputation of 90. Not 90,000, not 9,000, 90. 1. Harsh: Cruel or severe. I personally do not think -1 or What have you tried? are harsh. However, they have been deemed to be counterproductive and that is where the prevention comes from. In my opinion, harsh comments would be more along the lines of direct insults or ad hominem attacks. Meta-meta: why is meta full of close-warriors? Why aren't you asking more Questions?